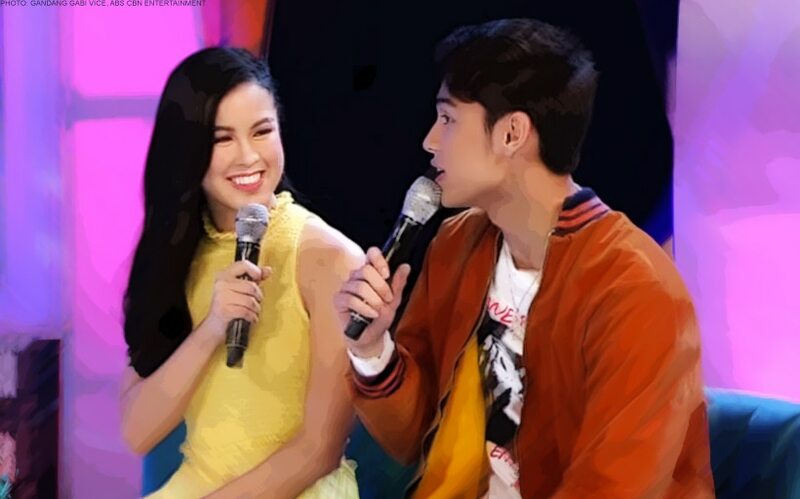 Dahil iba talaga sila, Donny Pangilinan and Kisses Delavin dropped giant kilig bombs on their fans on "Gandang Gabi Vice" yesterday, October 7. And because we're big on DonKiss over here, we've decided to compile every single time Donny paid his leading lady a compliment, because this is exactly what your DonKiss heart needs right now. 1. "Inspiring talaga 'to si Kisses. Ang dami na niyang pinagdaanan [sila ng family niya], pero nandito pa rin sila. And very happy and very joyful in life." 2. "Nakikita mo talaga na si Kisses, hindi siya of this world. In a good way." 3. "Ganyan talaga siya sa mga tao, eh, kahit hindi niya kilala tatanungin niya, 'Kumain ka na ba? ', 'Kumain na ba kayo? ', 'Okay lang ba kayo?'" 4. "Dear Kirsten, continue to shine like a star and always remember that the darker the night, the brighter the stars shine." 5. "Oo naman [love kita], as a friend din." Kisses previously starred in the 2017 rom-com "Loving in Tandem" topbilled by her fellow "Pinoy Big Brother: Lucky Season 7" housemates Maymay Entrata and Edward Barber. Her first film with Donny, the millennial film "Walwal" was released this year. Come December, DonKiss will star in the Vice Ganda-led "Fantastica: The Princesses, The Prince, and The Perya", which will be ABS-CBN Films, Star Cinema's official entry to the 2018 Metro Manila Film Festival. Vice Ganda, 'naiinggit' sa MayWard, DonKiss, at LoiNie?! MayWard, DonKiss + more, super trending sa #ABSCBNBall2018! ABS-CBN Ball 2018: Most kilig candid moments from love teams, real-life couples!